​The O‘ahu ‘Elepaio (Chasiempis ibidis) is a territorial, non-migratory, monarch flycatcher (Monarchidae) endemic to the island of Oahu in the Hawaiian Archipelago. Elepaio also occur on Kauai and Hawaii, and the forms on each island were treated as subspecies for many years, but morphological, behavioral, and genetic evidence indicate elepaio on each island are separate species. In 2010, the American Ornithologists’ Union changed the taxonomy so that each island form is recognized as a distinct species, based on research conducted by Dr. Eric VanderWerf that you can read about here and here. The Kaua‘i ‘Elepaio (C. sclateri) and Hawai‘i ‘Elepaio (C. sandwichensis) are fairly common and widespread, but the Oahu Elepaio is rare and locally distributed, is listed as endangered under the U.S. Endangered Species Act and by the State of Hawai‘i, and is considered endangered by the International Union for the Conservation of Nature. ​The Oahu Elepaio was abundant and widespread in forested habitat throughout the island in early 20th century, but it has declined steadily and the current geographic range encompasses about 5,187 ha and has declined by 75% since 1975, becoming fragmented into four larger subpopulations with 100 or more birds each and 12 smaller subpopulations. In 2012 the total population was estimated to be 1,261 birds (95% CI=1,205-1,317), consisting of about 477 breeding pairs and 307 single males. 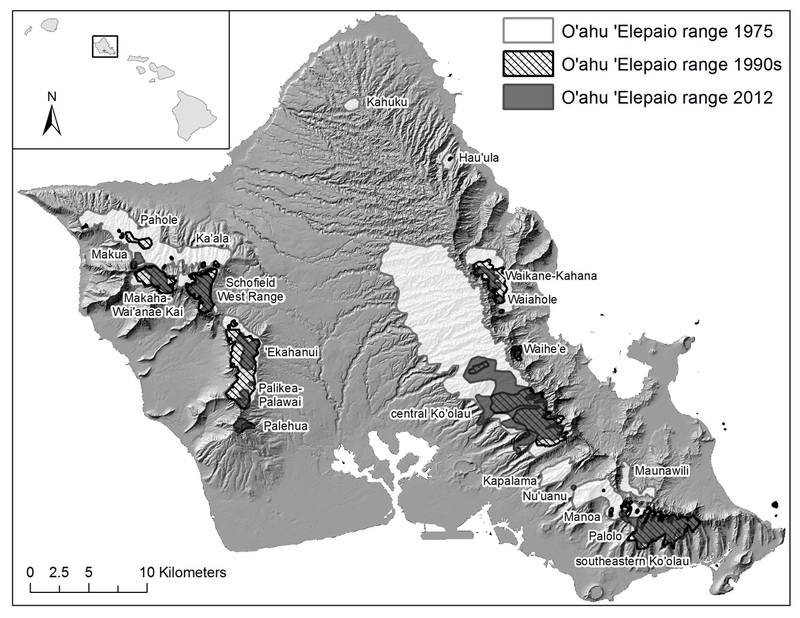 Read more about the current distribution and abundance of the Oahu Elepaio here. Elepaio are very long-lived for their size. The oldest known Oahu Elepaio lived to be at least 22 years old! When it was banded in 1995 in Kuliouou Valley it was already an adult and therefore at least three years old, and it was last seen in 2014. Above is a photo of it taken during the last observation. Two more Oahu Elepaio in Pia Valley and Schofield Barracks are 19 and 20 years old and are still alive. One Hawaii Elepaio was known to be even older, at least 23 years old! The annual survival rate, or proportion of birds that live from one year to the next, is also very high. In males, the annual survival rate averages 85%. In females, the survival rate is lower, only 55%-74%, because some birds are preyed on by rats, but if rats are controlled the survival rate of females increases to 84%, similar to that in males. Increasing the survival rate of breeding females is the most important benefit of controlling rats. The Oahu Elepaio is the only Hawaiian bird known to engage in the unusual behavior called “anting” (pictured below). There are two types of anting behavior; in active anting, a bird picks up an ant in its bill, but does not eat it, and then wipes the ant on its feathers. In passive anting, a bird stands on an ant nest and allows the ants to swarm over its body. It is thought that the formic acid secreted by the ants helps to control parasites. Birds sometimes “ant” with objects other than ants. We have seen Oahu Elepaio anting with a garlic snail, a millipede, a Christmasberry fruit, and an ant. None of these things are native to Hawaii, but all of them have strong chemical properties. It is amazing that Oahu Elepaio have learned to recognize and use the beneficial properties of these things. VanderWerf, E.A. 2005. Elepaio “anting” with a garlic snail and a Schinus fruit. Journal of Field Ornithology 76:134-137. A male Oahu Elepaio holding an ant in its bill during a behavior called "anting" in which the bird wipes the ant on its feathers, possibly to repel parasites. In Hawaiian culture Elepaio are considered the 'aumakua, or guardian spirit, of canoe makers. According to one legend, if an Elepaio pecked at a koa tree it meant the tree was infested with insects and not suitable for making into a canoe. If instead an Elepaio landed on the tree and sang "ono-ka-ia", or "sweet-the-fish", it indicated that the wood was sound.